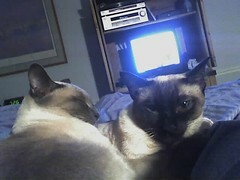 It's funny how much better life is when you have cats pin you down in bed for several days on end. I'm feeling significantly better, and quite thankful to have shaken off the worst of what by all accounts is the Cold From Hell. Everyone seems to be getting it, and it seems to be a uniformly miserable experience. It does make for some fun conversations, though--"Have you gotten The Headache yet?" and similar. I thoroughly enjoyed the Wallace and Gromit movie, which is not so much laugh-a-minute as it is a constant good-natured chuckle. It's a delightful little film. I was not prepared for the "Madagascar Penguins" Christmas-themed short cartoon though--is it just me, or does Christmas start sooner every year? It was a cute cartoon, but it probably won't even be playing when it's even remotely seasonal. Can we please, pretty please, with Jack Skellington on top, please not start with the holiday cheer until after Halloween? I determined that my lack of forward motion on experimenting with TurboGears was the lack of a proverbial itch to scratch (well, that and the whole coughing up my lungs thing). Luckily, I think I've managed to uncover an itch from some ages back, so at least now I have a little direction and focus. It's also been a bit of fun to hang on the #turbogears IRC channel and occasionally have something useful to contribute. On house-related matters, not only am I now the proud owner of attic insulation (installed even), we are halfway to having bathroom fans that are actually effective at circulating air and moisture out of the house. Much rejoicing! To counterbalance this otherwise sunny progress report, however, it seems that our lawn mower has, with a saddening sigh, released the last of its Magic Blue Smoke, and try as we might to convince it otherwise, it seems that it shall mow no more. The timing was oddly perfect--the first dry day that both of us have been in good enough health or schedule to allow us to partake lawn maintenance, and boom! It wouldn't be that bad, except both neighbors mowed their lawns this weekend, so ours bears an increasing resemblance to jungle foliage. Definitely not high on the curb appeal scale. Music: London Philharmonic Orchestra - "Us and Them"